We have travelled such an unimaginable distance all within the course of twelve months that, at the end of a 3-all draw against Hong Kong in the opener of the 2011 Long Teng Cup, I could even afford to be blasé about the result. Time was when if our national football team scored against an opponent at all, it was the sort that the opponent gave us rather than something we intended. Against Hong Kong yesterday, there was almost perverse satisfaction despite the result in seeing the shoe on the other foot. For a change, it was our national team giving away the early Christmas presents. We were slow off the starting blocks to begin with. The timer showed a mere 1:22 had elapsed when Hong Kong scored with a soft header off a left wing cross. The new Philippines goalkeeper Roland Mueller could, perhaps, have stayed on his line. A Hong Kong national would have seen a magnificent header; but my Filipino eyes saw luck written all over the goal. What Roel Gener was doing at rightback, we shall leave it to Michael Weiss to explain if he cares. The ease with which the Hong Kong left winger found space and delivered the cross and his subsequent forays down that flank as the game wore on exposed an undesired vulnerability. In fairness to Weiss, Gener was substituted at the half. Hong Kong’s second was not any more convincing, either; and by this time, our team had woken from slumber and had picked up some of the possession. Young Matt Hartmann at leftback was dispossessed; the low cross that led to the goal, in fairness, was inch perfect. I could have sworn the striker was offside, though. I would have appreciated instant replay; but there was none. So I will simply say because I am Filipino that it was offside. Before the first half was over, our team was level. In the 28th minute, one Hong Kong central defender so coveted Phil Younghusband’s jersey but it never occurred to him to simply ask for it. Because the two were inside the box, the referee had no hesitation in pointing at the spot for the blatant shirt-pulling. 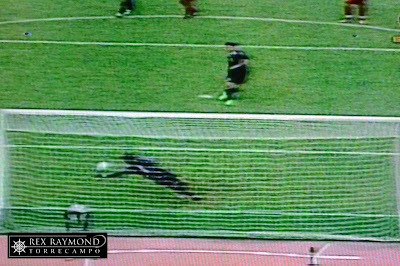 Younghusband himself took the penalty, sending the goalkeeper diving in vain to his right. 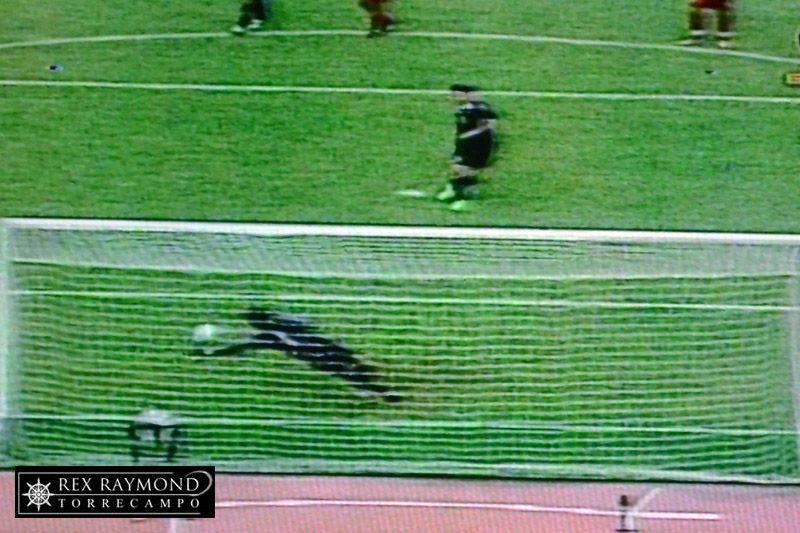 The referee, however, had spotted Emelio Caligdong encroaching into the area and whistled for a retake. He was technically correct, but still… Fussy ref… Fussy! 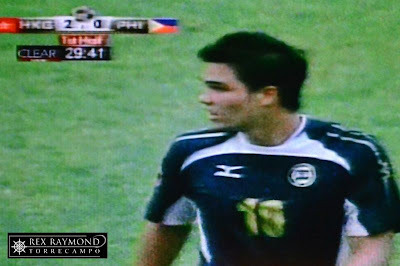 For Younghusband, it was no problemo, this time sending the ball the other way. 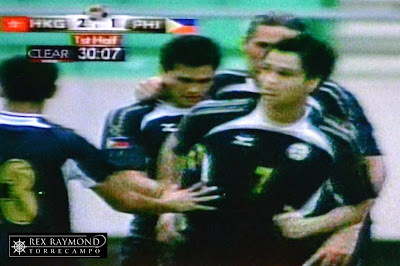 With just a couple of minutes in the half remaining, Younghusband slipped a pass through to Caligdong, who scored with a low left-foot drive. Hong Kong, which had started brightly, could not quite come to terms with what was happening. For all the possession and corner kick stats in its favour, its football had really degenerated into the pedestrian. When play resumed after the break, Carlos de Murga had slipped into his favoured right back in lieu of the ineffectual Gener. 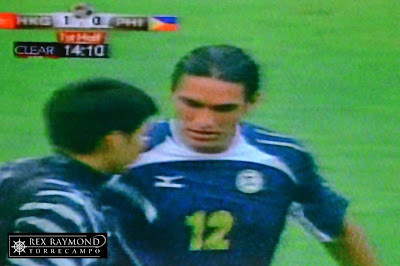 I was impressed with de Murga the first time I saw him in the Icanserve series against Global FC. Although I later learned that rightback is his natural position for his Spanish Division III side Racing Club Portuense, he looked technically gifted and not unlike the gifted Fil-Dutch midfielder Paul Mulders in his vision. De Murga, earlier playing more in the middle of the pitch, was excellent in bringing team-mates more into the game to give the Philippines more possession. 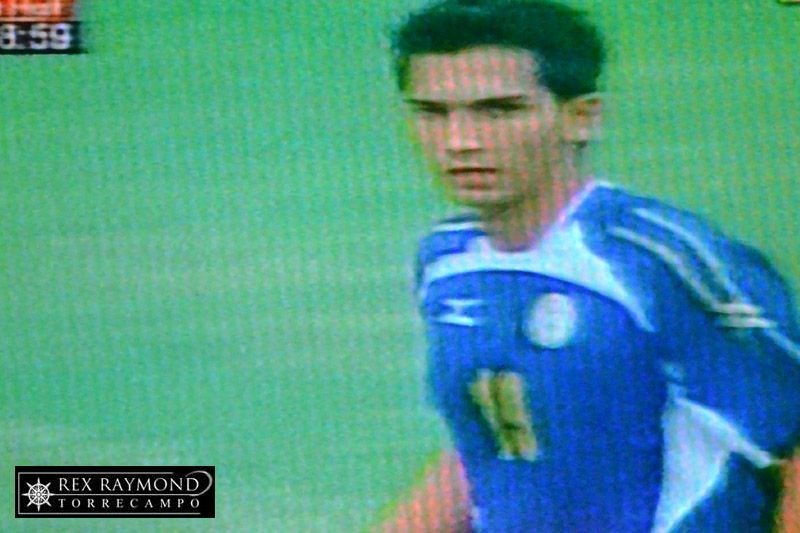 Mark Hartmann had also come in to play alongside Phil Younghusband upfront; with Angel Guirado dropping into midfield. Guirado is the sort of infuriating player who can be excellent when in form and be something of a headless chicken when he is not. Yesterday looked more like one of the headless days. To be fair, the lad was just getting back to full fitness. 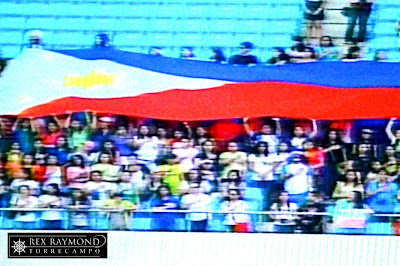 The Philippines went on the front foot after the resumption; and it was no surprise when Caligdong scored his second of the afternoon. Receiving the ball wide on the left flank, he danced his way past defenders and then buried a wicked right-footed drive into the roof of the net. 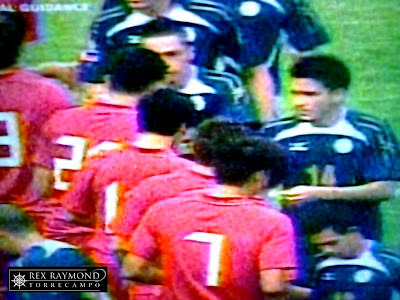 At that point, despite the slender one-goal lead, it looked game, set and match for the Philippines. Hong Kong just looked positively bewildered. Then, just three minutes after Caligdong’s second, Hong Kong had a man sent off. What is it about playing against ten men that makes our team so vulnerable? 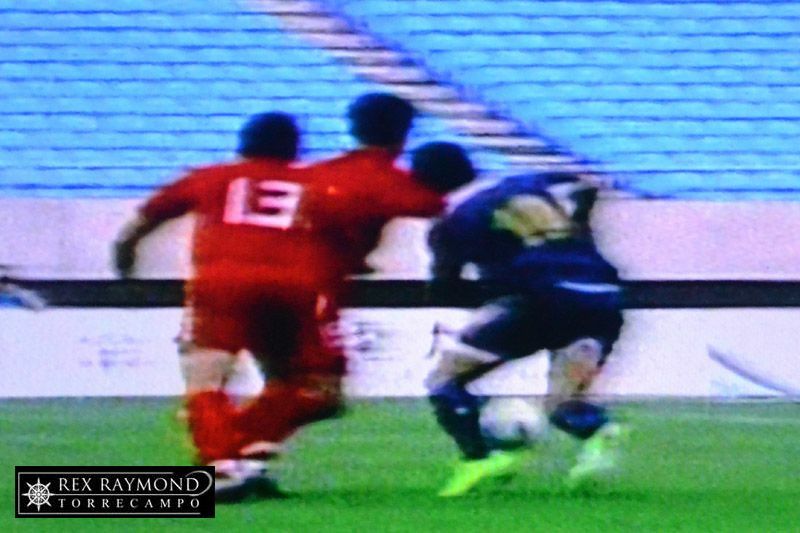 We saw this vulnerability against Kuwait in the second leg; and here was lightning striking twice. If anything, we were being pushed back more into our own half after Hong Kong had been reduced to 10. The referee, as they rather tend to worldwide, fell for it hook, line and sinker. Mueller parried the ensuing freekick; but only into the foot of a Hong Kong player, who duly obliged. Perhaps, the defence was a tad flatfooted; but if there was anything that could have been avoided, it was the foul in a dangerous area. At any rate, I am not about to lose sleep over the result. 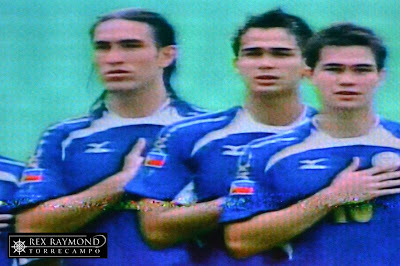 The Long Teng Cup is just one of those warm-up tournaments, anyway; and it affords all of us a glance at new and emerging Azkals. Just as the 2010 edition of the same competition served as the launch pad for the fabulous Suzuki Cup adventure, who knows if this one will lead to a thrilling run in the coming SEA Games? We were also by no means at our strongest, with many of our starters in Europe for club commitments. Hong Kong, on the other hand preparing for its next World Cup tie, was at full strength. Yet, despite a shaky opening few minutes, our team managed to make it look very pedestrian, indeed. I am a happy man these days! If we can bring home some silverware at the end of the week, why the devil not? Does anyone even recall the last time that we did?